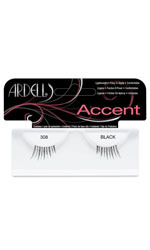 Enhance the density along the outer edge of the lash line with Ardell Accent Lashes, half lashes for a prettier look. Choose from a collection of Ardell Accents featuring half lashes to fit your eyes and mood. The perfect way to accentuate your natural lashes, glamorous half sized lashes designed to enhance your natural lash flutter. To create a more subtle, elegant style, these Accent Lashes are perfect as each strip will cover half the lashline. Half lashes offer a less dramatic alternative to full lashes making them ideal for day time wear. Enhance the density along the outer edge of the lashline for a prettier look with half lashes. Designed with an added flare and feathered effect to help enhance your eyes. Designed with a light, feathered effect to help enhance the outter corners of your eyes.